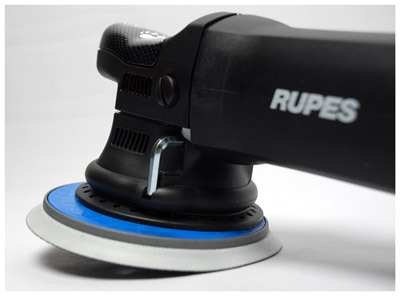 Home > Shop By Brand > RUPES Polishers FREE SHIPPING! > Wolfgang RUPES LHR 21ES Concours Polishing Kit FREE BONUS FREE SHIPPING! German polishing compounds with the best Italian-made buffer = perfect paint! The Wolfgang RUPES LHR 21ES Concours Polishing Kit combines the best polishing compounds by Wolfgang with the smooth and capable Italian-bred Rupes LHR 21ES Big Foot Random Orbital Polisher so you can restore the shine and luster to ANY paint system with ease! This all-inclusive polisher kit includes everything you need to remove swirl marks, oxidation, light scratches, and water spots from your vehicle’s finish. The included Wolfgang Deep Gloss Paint Sealant 3.0 locks in the shine and provides durable, long-lasting paint protection. The Rupes LHR 21ES Big Foot Random Orbital Polisher ensures a perfect finish with its random orbital motion and exceptionally large throw. One of the biggest advantages of the LHR 21ES is that no swirls or holograms (also referred to as buffer trails) are instilled into the paint as you polish. A conventional rotary/circular polisher, while very effective at polishing paint to remove defects leaves swirls and holograms in the finish as a result of its direct drive, circular motion. Simply put, the Rupes LHR 21ES Big Foot Random Orbital Polisher leaves you with a perfect finish that’s free of swirls and holograms – all without the risk of burning through the paint. The Rupes LHR 21ES is so easy to use that even a novice can have the polisher mastered after only one panel! Wolfgang Total Swirl Remover 3.0 is a hybrid of our original Total Swirl Remover formula and Menzerna’s fast-cutting polish for ceramic clear coats. It combines Wolfgangs diminishing abrasive technology with Menzerna’s special milling process, which produces consistently sized, fast cutting abrasives. Our specially milled abrasives work to eliminate imperfections without creating new ones. These small abrasives are milled for consistency. As they smooth over a scratch, the abrasives diminish at the same rate because they all started at the same size. The result is smooth paint in fewer steps. If another step is needed to fully restore the gloss, simply switch to a softer foam pad. Wolfgang Total Swirl Remover 3.0 works more or less aggressively based on your pad selection. 8 oz. A total retail value of $604.90. You save $104.91!